An anniversary memorial service for a loved one should feel nothing like a funeral. After one year or many years have passed, you can gather together to share the fond and funny memories of your loved one without the sorrow you felt in the wake of his death. Coming together with the other people who knew and loved him will keep him alive in your hearts, and organizing this event can bring back all sorts of wonderful memories. Choose a location that the person of honor would have appreciated. Plan the event in a local park if he loved the outdoors, or book a private room in a noisy pub if he loved to socialize over drinks. You may also host the event in your home, or hold it at a bowling alley or golf club so you can all spend an afternoon doing an activity he loved. Make a guest list and send out printed invitations. 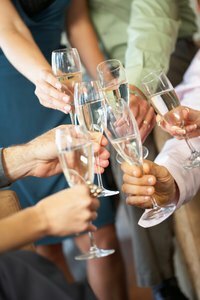 Limit the guest list to his closest friends and family; a group of 15 or 20 people is appropriate for most events. Include a phrase on the invitation like "Please join us as we joyfully celebrate the life of..." so guests will understand what type of event they're attending. Set up an area in the party space where you can display photos and other mementos of the deceased. Hang his military uniform there, set out artwork that he created or simply display books and records that he loved. Create an area where you can ask guests for their memories. Set out index cards or sheets of scrapbook paper with pens and hang a sign asking guests to stop and write down anecdotes or treasured memories of the person of honor. Buy or make some simple snacks. Provide wine and beer for an adult crowd, or simply set out lemonade, iced tea and water. Provide light appetizers like miniature quiches and tarts, or serve a buffet of the favorite foods of the person of honor. Create a slideshow of photos of him to play in a loop on a projector, if possible. Make a playlist of his favorite songs to play throughout the event on a low volume. Give a speech midway through the event. Talk about why you wanted to hold the event and share some memories of the deceased. Read from some of the cards guests have created or invite other guests to come up and speak. Try to keep the atmosphere somewhat light; even when sharing touching memories, try to make guests smile more than cry. Ask everyone to join you in a toast or moment of silence. Pass out favors at the end of the memorial. Give out packets of seeds so guests can plant flowers in tribute to the guest of honor, or other party favors. Save the cards guests write out about the person of honor so you can create a scrapbook later on. If the deceased was religious, consider asking a spiritual head from his place of worship to come and give a prayer. If you're inviting elderly people to the memorial, be sure to have plenty of seating and offer to transport them back and forth if necessary.